I don’t have a real analysis of the first chapter of V. just yet. 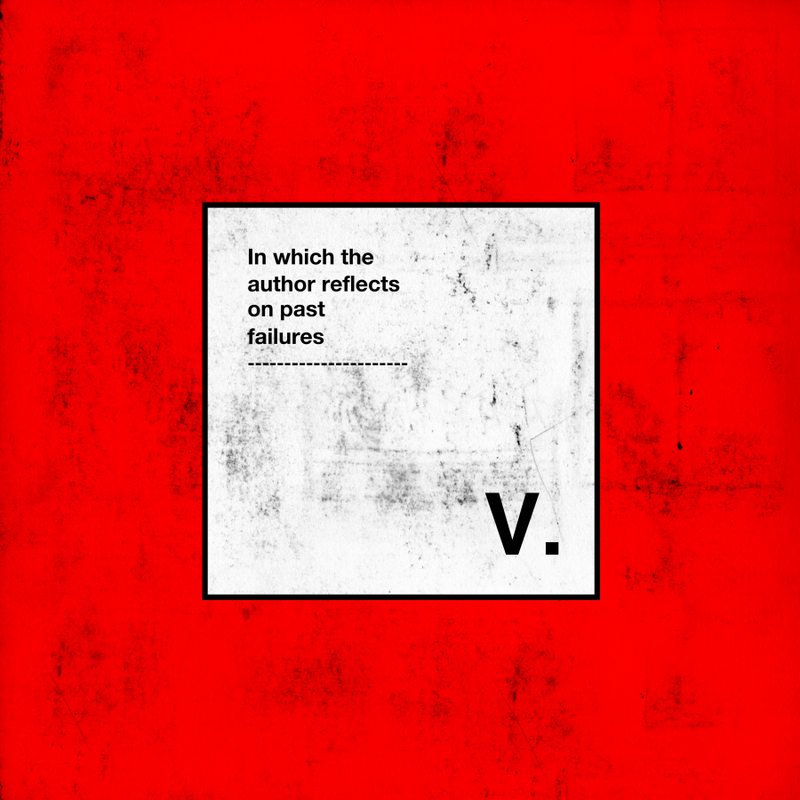 I’m working on a few different projects right now and I’ve held off really delving into V. until I can give it the serious attention it deserves. Nevertheless, the brief parsing of chapter one I’ve done reminded me why I took on this project in the first place. Aside from the wanting to reacquaint myself with some of Pynchon’s novels, I’m also drawn to them for purely personal reasons. I have a rich history with these texts. Given that I’m in the midst of some rather large life changes (new career, new home, etcetera), it’s no surprise that I’d turn back to a set of works that have been so influential for me in the past while I get my bearings. Pynchon’s novels were the first truly difficult texts that I cut my teeth on as a scholar rather than just as a reader. I had read other weighty texts before, but Pynchon’s work was the first that I sat down with and realized that I could not walk away. I was too deeply entwined with the stories and the prose to simply put them aside and turn back to the more prosaic everyday world. I would go on to measure other literature by way of Pynchon – not as judgment, but rather as a means of grounding myself by identifying my own abilities and growth as a critical reader. I have V. To thank for that self-awareness because V. is the one that broke me. Like many people my first exposure to Pynchon was through The Crying of Lot 49 when I was in college. I was completely taken in by it. To my deep shame I fell into a postmodernist fervor that made me fairly intolerable for a number of months. Thankfully I got better. I learned to appreciate postmodern literature for the questions it asks and to distinguish the powerful questions from the pretentious posturing. Whatever the case, I knew I wanted to read more so I decided to start with Pynchon’s first novel in terms of publication. I didn’t get to it though until I was in London on a four-month study abroad trip. For some reason, as I was in the midst of a life changing experience I decided that the thing to do would be to tackle the most difficult and engrossing novel I could think of. What would be better than to inexorably tie a great piece of literature with a profound experience like travelling in Europe. It didn’t quite turn out the way I’d hoped. I made it about a third of the way through V. I even took it to Italy where I distinctly recall sitting on a train between Rome and Florence wondering what, exactly, it was I had just read before putting the book away to write some very very bad poetry. That’s about it though. I never made it further than a few chapters into the book. I also never made it very far in my career as a poet (Thank God). V. was, for some time, too tough for me. I wasn’t ready for it yet, and it took some reflection to realize that I wanted to get ready to read it. Ultimately, I wouldn’t come back to it for two years and only after I had muddled my way through Gravity’s Rainbow for the first time. By then I knew the sort of reader I wanted to be and that made a huge difference in how I approached V. on my second try. The book that ended up inexorably tied to my stay in London? Terry Pratchett’s The Thief of Time. I picked it up at the Camden library just before coming down with a cold. I read it over the course of two or three days while I recovered. I’m a huge fan of Pratchett thanks to that book. That’s another series of posts though.